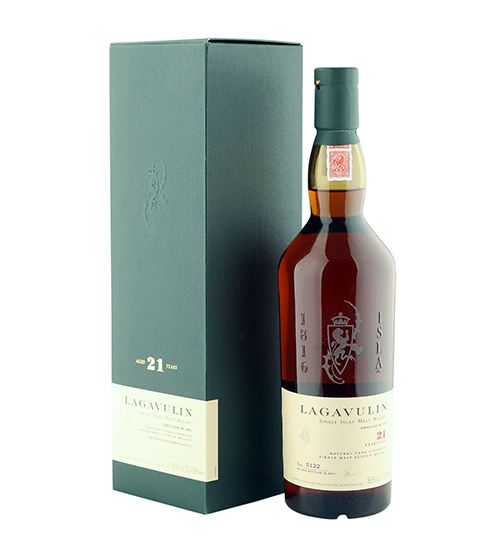 One of the world’s best known bottles is this Lagavulin 21 Years. Released in 2007 as a limited edition, the pronounces aging in European ex-Sherry Oak barrels has created a peculiar whisky. Needless to say how sought after this bottle is. The release price was set at around € 170. Today, the few bottles in circulation exceed the € 2000. A whisky that has become legendary. Nose: needs some time in the glass to open up. In the beginning the high gradation is perceptible, which becomes gradually less evident. Peat is present, but it is completely different compared to the younger Lagavulin. It is gentler and less mineral. Hints of smoke, burned wood. Then, the aging in Sherry barrels makes itself present. Mahogany, wood polish and red fruits (cherry and strawberry). Lastly, hints of coffee and dark chocolate. Palate: spices (black pepper) and red fruits, outlined in cherry. Round and “chewable”, it presents an exceptional intensity. It continues with peat and the red fruits, which gradually evolves. Finish: of long persistence. There are peat, black pepper, spices and red fruits (mainly strawberry) present. The marriage between sherry and peat in this Lagavulin 21 1985/2007, brings this whisky to a high level of complexity. It is intense and balanced. Every feature excels. Lagavulin is confirmed as one of the best distilleries in recent years.